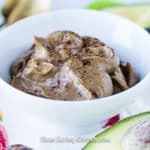 Avocado Chocolate Pudding (Vegan, Paleo) - Tastes Like Mousse!Avocado Chocolate Pudding (Vegan, Paleo) - Tastes Like Mousse! This Avocado Chocolate Pudding recipe is an easy, dairy-free dessert full of decadent chocolate flavor. You only need a few ingredients to make this delicious treat. Use a spoon to scoop out the avocado from the skin. Place the avocado in the bowl of a food processor or the pitcher of a high-speed blender. Add the dates, maple syrup, cacao powder, vanilla extract, sea salt, and dairy-free milk. Process on high for about 30 seconds, or until the ingredients have fully combined and turned creamy and smooth. Scrape down the sides of the food processor or the blender, if necessary, and process another 10 seconds. Store any leftovers in a tightly sealed container for up to 4 days.